and Jeanie Wyss, Freddy Halmes and Philip Isaacs. Fujii, Jeanie Wyss' sister, kept the books. Many hearts were broken when the Swiss Inn closed shortly after Thanksgiving. But a mere three weeks later, the time has come to heal. On Friday, the beloved restaurant in Niu Valley reopened. New name, new owner, but the menu remains intact. The Swiss Haus has been quietly drawing back the regulars. 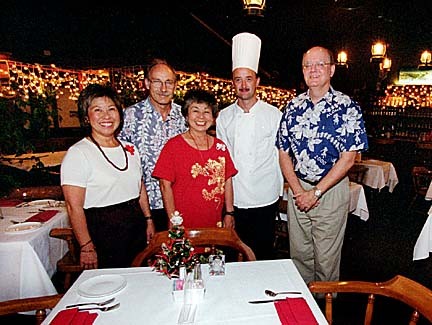 The new chef-owner is Freddy Halmes, former executive pastry chef at the Hawaiian Regent Hotel. Running the front of the house is Philip Isaacs, whose day job is food service director at Arcadia Retirement Residence. The two are learning their new positions from the originals -- Martin and Jeanie Wyss, the husband-wife, chef-manager team that made the Swiss Inn a neighborhood institution for 18 years. The Wysses had planned to turn over the restaurant to another buyer at the end of October, but that deal fell through so they kept it open through Thanksgiving. It was during that period that Halmes and Isaacs came to dine. The Swiss Inn had always been a favorite of theirs, Isaacs says, but that night Halmes was struck by inspiration. "He went back to the kitchen and talked to Martin and came back to the table and said, 'Philip, I think we can do this.' "
Halmes, a native of Belgium, has been in Hawaii 12 years, gaining his U.S. citizenship last year. "I just like this place," Halmes says of his new restaurant. "I wanted to keep it as intact as possible." Halmes resigned from the Royal Hawaiian last month when Marriott bought the hotel. He recalls quitting and making an offer on the Swiss Inn the very day the hotel sale was announced. His severance pay was his down payment. The lease and their temporary liquor license came through Thursday; they opened Friday. The staff of 30 will stay on. So will the Wysses, until Halmes masters Martin Wyss' recipes for such classics as osso buco. Jeanie Wyss says she and her husband are relieved to have someone take over the business they started in 1982. "We worry about our customers because they're like our friends now." Halmes, as a pastry chef, faces some challenges in learning the specialties of the house, but "he'll do fine," Wyss says, "because Freddy's real hard-working." For their own part, the Wyss' are looking forward to a break in the intense demands of running a restaurant. Jeanie says she'd like to get involved in a community project and that Martin would like to learn about computers -- "although I told him he needs to learn to type first." Swiss Haus, in Niu Valley Shopping Center, is open for dinner at 6 p.m. Wednesday through Sunday, just like before, and will honor all Swiss Inn gift certificates. Call 377-5447. The Swiss Inn's celebrated salad dressing -- which Jeanie Wyss calls a "typical Swiss-type dressing" of oil and vinegar -- is now for sale in bottles. Wyss husband Martin are now marketing the dressing they popularized at their restaurant. Fujioka's Wine and Spirits and Strawberry Connection are carrying the Swiss Inn Salad Dressing for about $4 for a 12-ounce bottle. It's also available at the newly opened Swiss Haus.